Reasonable adjustments; have you made yours? This week the Inclusive Digital Resources Working Group met for the first time. The aim of this group is to make recommendations for ensuring all students/staff have access to accessible and inclusive digital resources for learning and teaching. One of the drivers for the formation of this group is changes to the DSA (Disabled Student Allowance) which will remove additional technology support for students with dyslexia and other conditions. Peter Willets announced the changes in April 2014 saying ‘The need for some individual non-medical help (NMH) may be removed through different ways of delivering courses and information. It is for HEIs to consider how they make both anticipatory reasonable adjustments and also reasonable adjustments at an individual level.’ Greg Clark in September 2014 added ‘alternative provision in the form of university provided services such as printing services and books and journals in electronic format to be considered as alternatives’ and included the reminder ‘Universities should discharge their duties under the Equality Act to make reasonable adjustments to accommodate disabled students.’ The changes will come into effect for September 2016. Neither statement mentions the principles of universal design whereby changes for some create improvements for all. This is a shame because inclusion lies at the heart of the matter. It involves thinking beyond your own experience and considering diversity. Access to digital resources is a bit like the old Cadbury’s crème egg question How do you eat yours? We all have our own ways of working in online environments. The problems arise when assumptions are made which don’t take into account individual difference. The key to reasonable adjustments is choice. Digital data supports personalisation. There is no one size fits all way of designing documents and presentations so the best alternative is uploading versions which can be customised to suit individual preference. The user should be able to change the size, shape and colour contrast to whatever works for them Where users can’t adjust content, it’s down to individuals to make reasonable adjustments like not placing text over an image and providing textual equivalents and user controls to multimedia. Design is a political act. Putting content into the public domain involves decisions which determine access. This is power and with power comes responsibility. Reasonable adjustments to the provision of teaching and learning resources is not just about students with disabilities, its about maximising the affordances of virtual learning environments and improving access for everyone. The Inclusive Digital Resources Working Group will be contacting student reps, collating advice on best practice and making recommendations to the Learning Development and Environment Standing Group which reports to the Education and Student Experience group. 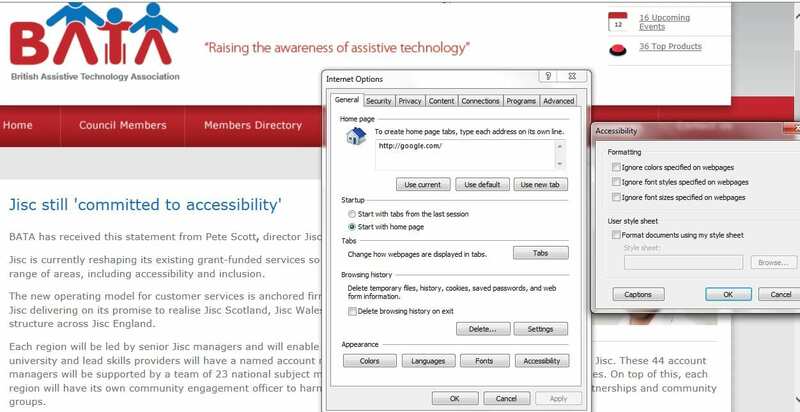 The principle of reasonable adjustments is an opportunity to go back to basics, to review the minimum requirements for digital content and rethink what its means to be digitally literate. So, on the question of reasonable adjustments – how will you be making yours?